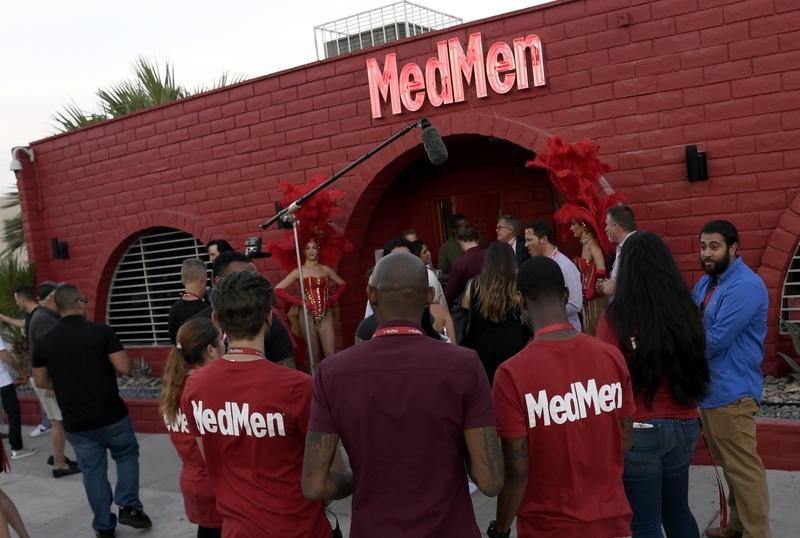 With red-feathered showgirls and an Elvis impersonator entertaining the crowds, MedMen opened its first branded store in the tourist mecca and entertainment capital of the world with classic Las Vegas flourish. Located at 823 3rd Street in the Arts District and mere blocks away from the Fremont Street Experience, MedMen Downtown Las Vegas is the company’s 14th store nationwide and the first of three branded stores planned for Las Vegas. MedMen has been operating a second dispensary in North Las Vegas, which will become MedMen Las Vegas Airport and move to 4503 Paradise Road near the Hard Rock Hotel, the Thomas and Mack Center and McCarran International Airport later this year. Las Vegas ranks as one of the world’s most visited tourist destinations with an average 40 million visitors annually. The historic center of Las Vegas and the original gambling district, the city’s downtown area has been going through a much-touted renaissance in recent years. Nevada also is one of the fastest growing state-sanctioned marijuana markets in the country. According to the Nevada Department of Taxation, cannabis accounted for about $386 million of the total statewide taxable sales for the period of July 2017 through March 2018, about 19.3 percent of the state’s growth in taxable sales compared to the same period last year.